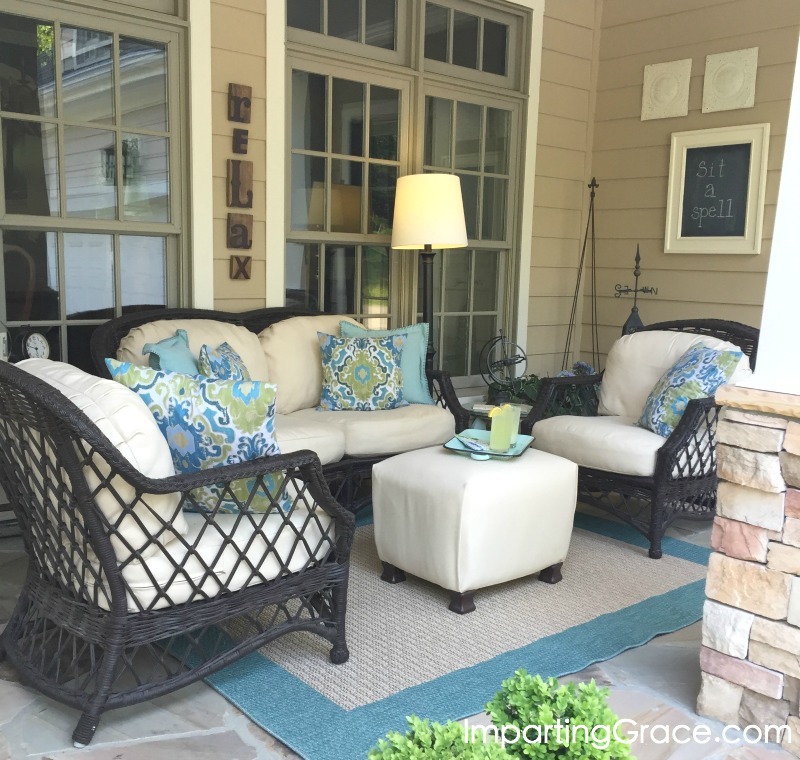 Today I'm excited to invite you to hang out on my newly refreshed front porch! My house is an 11-year-old suburban home with Craftsman influences, including a front porch flanked by stone and wood pillars. 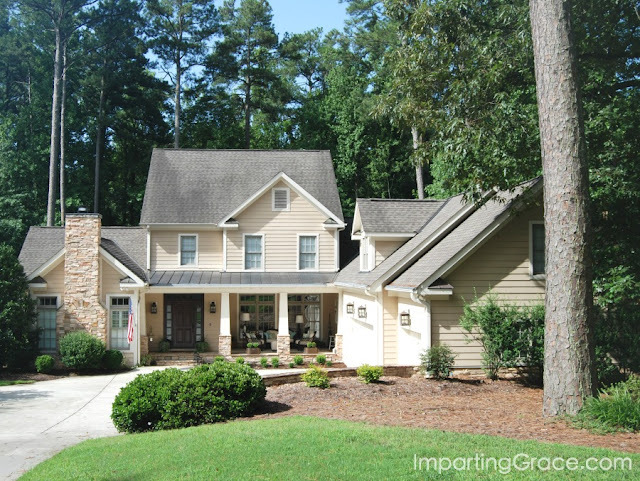 As I zoom in closer to the house, you can see that the front porch is nestled to the right of the front door. You can see that the space is very shady, even in bright daylight. I've always loved this porch. It's a sheltered space just outside the dining room. 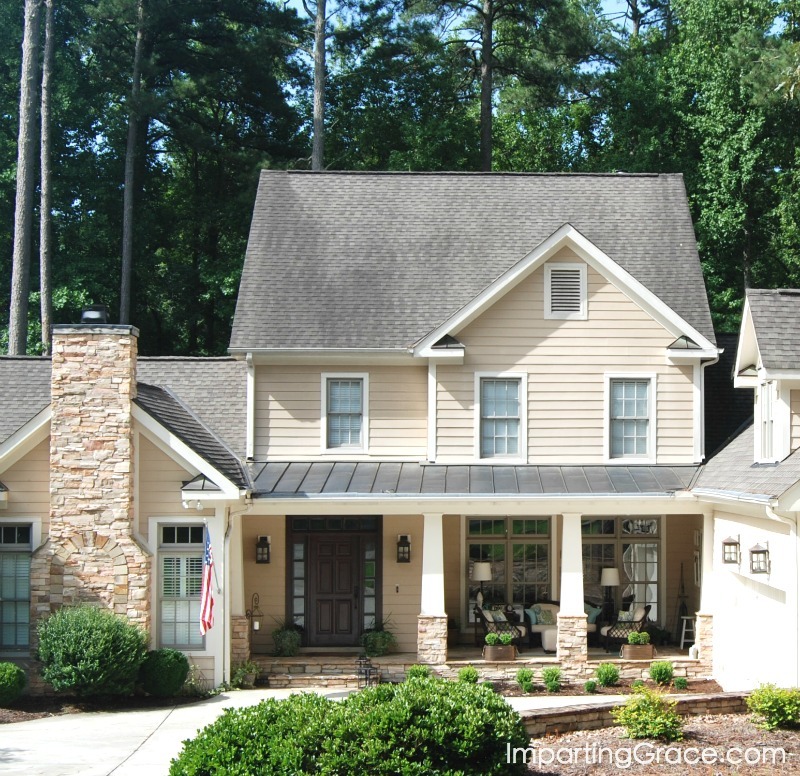 It's open only to the north side of the house, so it stays nice and cool even in hot weather. It functions as an outdoor living room for our home, so that's how I've decorated it. 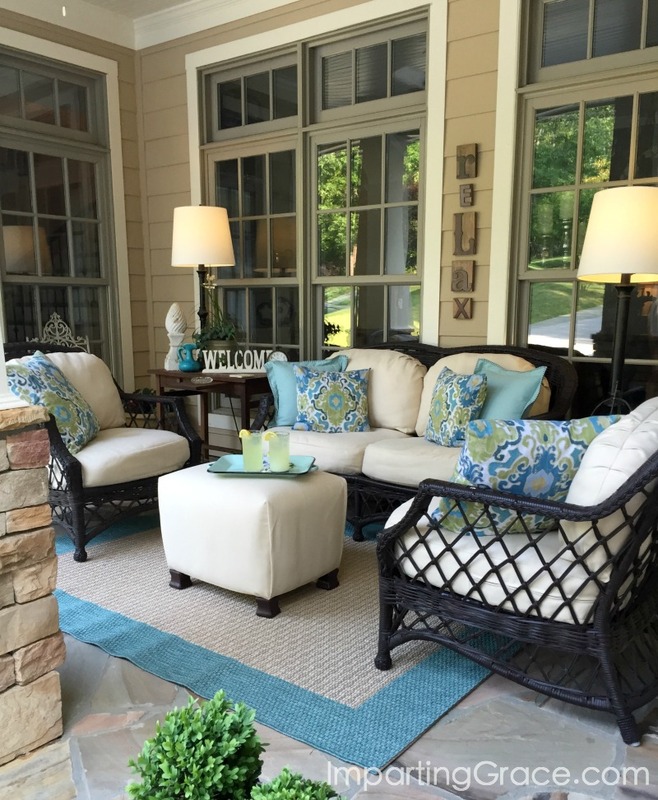 The seating pieces are all-weather wicker made by Lane Venture (the "Camino Real" collection). I have no affiliation with Lane Venture, but I recommend this furniture highly. We bought it in 2006, so it's been out here in all seasons for ten years. As you can see, it's still going strong. Like most of you, my budget for decorating is limited, and the purchase of the three wicker seating pieces consumed most of my funds. It was fun, though, to get creative with the rest of the porch. For instance, I made an ottoman from a styrofoam cooler! (Click here a tutorial for making the ottoman.) The tray holding drinks is a recent find from Decor Steals. The outdoor rug is from Target. I used an antique desk my parents gave me many years ago as an end table; I simply apply Howard's Feed and Wax to it from time to time. The lamps I found at Target. They're especially made for outdoor use, and I just love them. I keep compact fluorescent bulbs in them and keep them turned on 24/7, so there's always a light on to welcome you to my home. The lamps are also 10 years old; I've simply replaced the shades on them a couple of times over the years. The tabletop accessories are items I've gathered over the years. My favorite thing is the little clock from the Better Homes and Gardens line at WalMart. The decorative throw pillows I made (using this simple technique) from decorator fabric I bought at JoAnn. Since these are not made from outdoor fabric, I spray them well with Scotchgard fabric protector. The solid color pillows are from the Threshold line at Target. For outdoor wall art, I prefer items that are practically indestructible. The "Relax" blocks are Letterpress blocks from DaySpring. The chalkboard I made by painting over a Goodwill picture with chalkboard paint; the ceiling tiles are reproductions that cost just a few dollars. I really liked those green slipcovers, but they were made from fairly inexpensive outdoor fabric. While they looked wonderful when they were brand new, they did not hold up well. They faded pretty badly each time they were washed, and spot-cleaning them didn't work at all. So this year, I bit the bullet and had new covers made with Sunbrella fabric. If you're considering fabrics for outdoor use, I urge you to consider investing in Sunbrella. 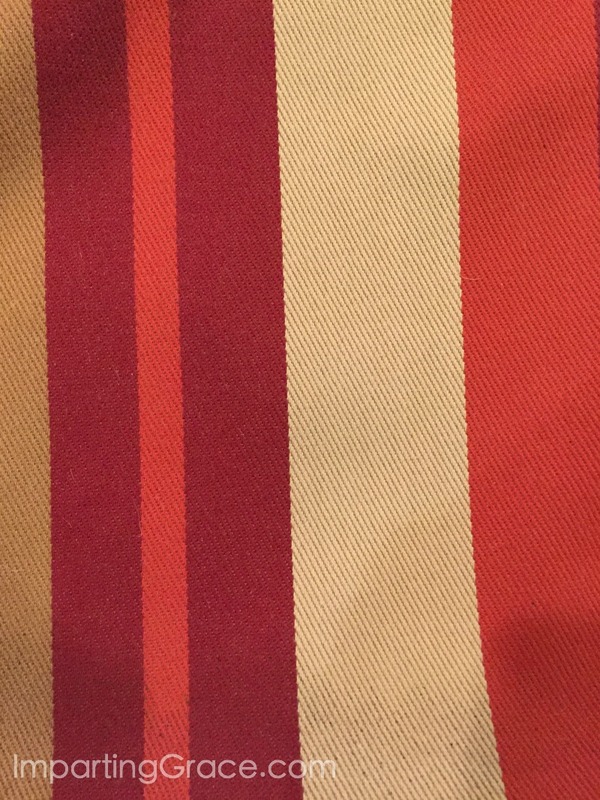 Yes, it's more expensive: I paid $35/yard for this fabric. But I'll tell you why I think it's worth the money to use Sunbrella fabric. Here's an after photo. See that clean space in the middle? 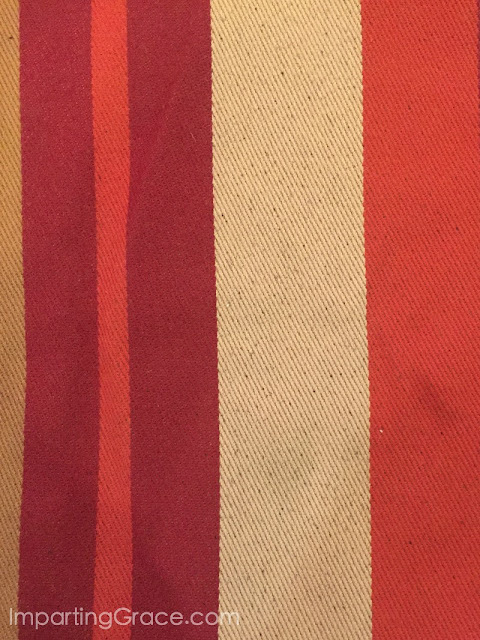 That's what happens to Sunbrella fabric when you bleach it. 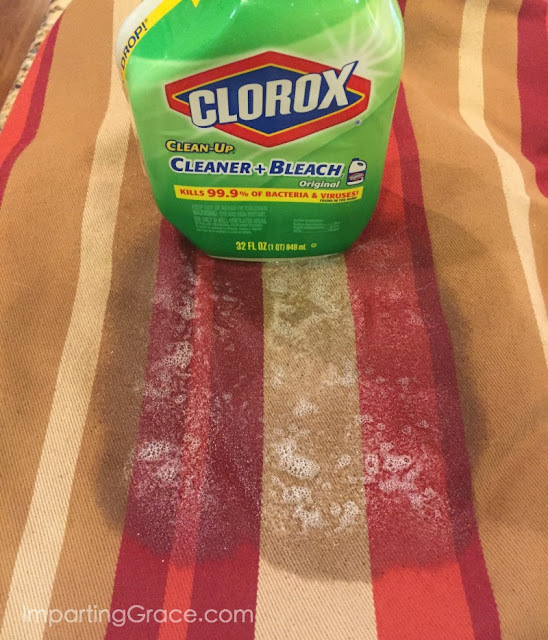 Only the dirt and mildew are affected; the fabric does not change. 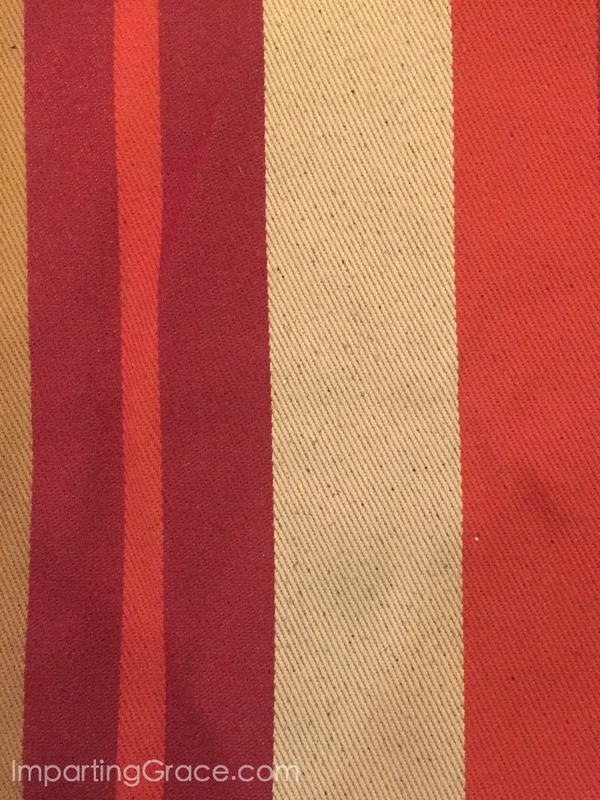 While I don't want to use the red striped fabric on my cushions any longer, it's still in perfect shape after all these years. I have no affiliation with Sunbrella, but I couldn't recommend it more highly. I think it's worth the extra expense for pieces that you want to look good year after year. Won't you come sip a nice cold glass of lemonade with me? Note: I have no affiliation with any of the companies mentioned in this post; I'm simply passing along what worked for me. 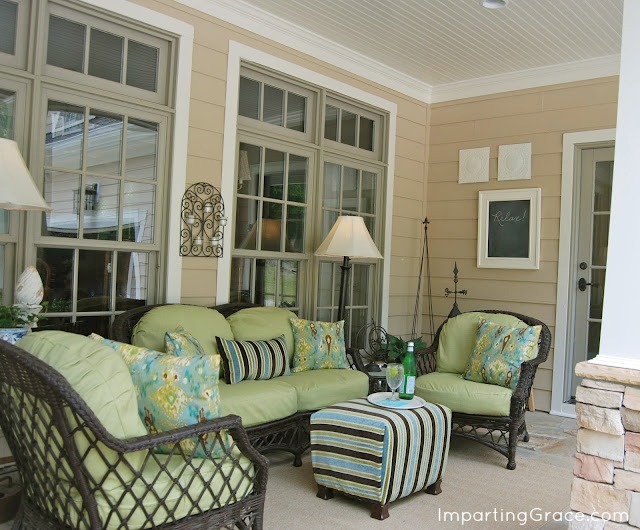 What a beautiful porch area you have created with your lovely furniture and décor! I enjoyed seeing the transitions with the different fabrics you've used through the years and how each one created a new look...all terrific! is a front porch! I know after 14 years, it is most probable due to the extreme heat! Your front porch looks so cool and inviting, dear friend! Thank you for your product testimonial! In this day, every penny counts! 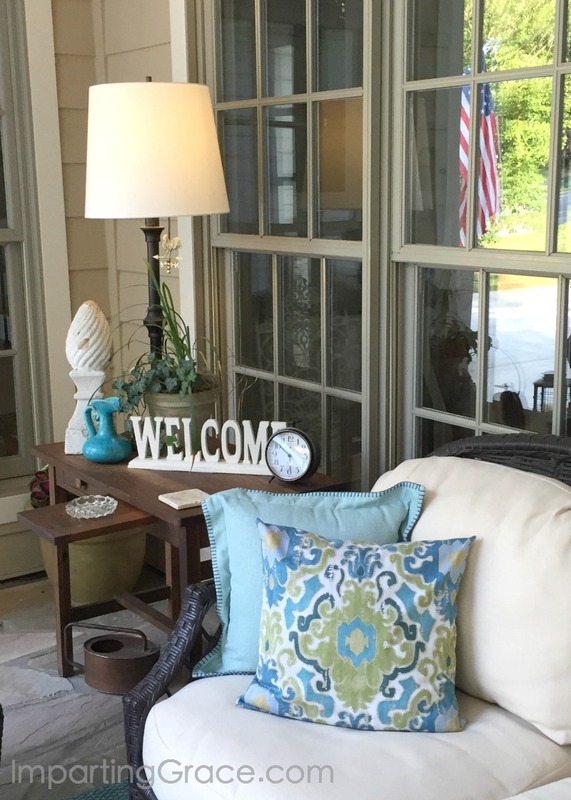 I so love the newly refreshed front porch....so, so beautiful Richella....love the new light and fresh look....your front porch has always been a favorite of mine!!! Oh wow, I adore your porch, it is so pretty and I love the new lighter decor. Perfect. 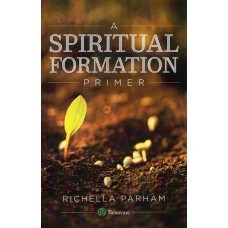 Richella, as always, your front porch looks so beautiful! It looks so airy and bright...perfect for enjoying the Summer. I would love to join you for some lemonade!! 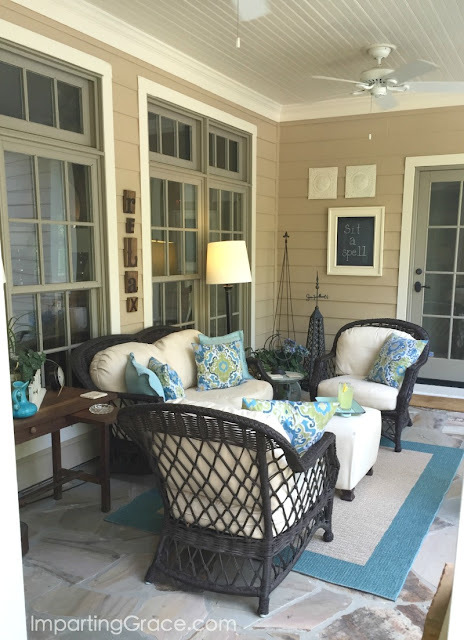 I have always loved your porch and its updates! Looks like a relaxing space to enjoy lazy summer days!! You really do a great job of decorating hon. I agree about the sunbrella fabric.....we had some on a awning, and it got very mildewed and we used a lot of bleach but it all came off and still looked great. Which is amazing! and I get no compensation for saying that either, just my experience as well. only bad thing about ours.....is it just gets too hot until about the end of October. Your porch looks so pretty! Your porch is beautiful! I love the blues against the white fabric. It really pops! I also love that you used antiques pieces on your porch. It adds such unexpected beauty to your space. It's so lovely!! I love the neutral covers because then you can quickly and inexpensively change pillows to suit your fancy! (I don't know about you but my "fancy" changes a lot! LOL!) And what a beautiful home. Love the idea to paint over a goodwill picture to make a chalkboard. So clever! OK, from now on I'll buy Sunbrella. I had no idea! Your porch has always been one of my very favorites. Thank you for joining TOHOT! Your refreshed porch looks so pretty. I know that you enjoy using that space. 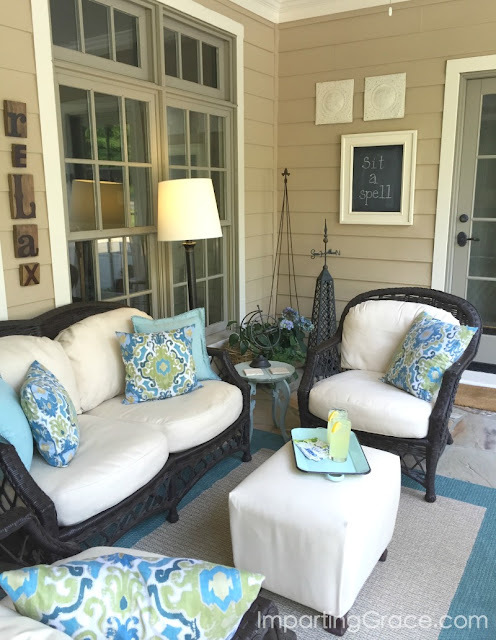 I recently refreshed our porch too but haven't gotten around to blogging it yet! I love what you do with your front porch... its always so inviting. And yes, I would love to have lemonade with you! I had covers made from Sunbrella fabric a few years ago. They have gotten dirty over the years. I can't wait to try this! Your porch is beautiful. I envy your porch! We have a back deck but it's not the same. Sunbrella is a great fabric- love the colors you are using now. Who would've guessed the ottoman is a covered styrofoam cooler! Richella, I always love to see your cozy porch and this look is fabulous! I am currently shopping for deck furniture so I really appreciate this post. Your decor is beautiful.